Date: 1st published 1977. This reissue 2010. Lucilla Andrews was only eighteen when, as a volunteer nurse at the beginning of the second world war, she experienced the grim realities of wartime . Young, inexperienced and coming from a comfortable and sheltered background, she found herself dealing with survivors from Dunkirk and the victims of the blitz. Seeing these horrors at first hand had a profound and lasting effect upon her, and made her determined to train as a Nurse at St Thomas's Hospital. No Time for Romance is her story, the powerful and moving account of a young girl in wartime London, learning the hard way about medicine, injuries and death, as well as love and hope. It is a story both of personal courage and of the courage of the British people at war. 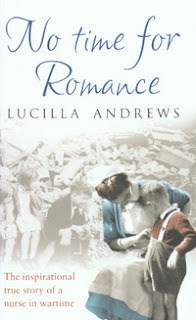 I first came across the name Lucilla Andrews at our local library back in the 1960's and '70's. I loved her romances set in war time England, they were real and wonderful and I often eagerly searched the library shelf for more of her books. Sadly now, they have disappeared off the shelves. I see on Goodreads one reviewer writes a simple sentence - a good old fashioned love story - medical! This book is a memoir of her life from about 1939 until about 1952. I learned about the hard life experiences that were the grist for her later medical novels. She had always wanted to be a writer, however World War 2 began just as she was leaving school. She spent just over a year as a volunteer in hospitals where the work was hard and long, with very little pay. She then went on to train at St Thomas's hospital in London ( where Miss Nightengale had started her school for nurses). All during this time she was nursing in a country which was constantly being bombed. The injuries were horrendous, the people amazingly resilient and courageous. This book gives great insight into the time and the people. By the end of the war Lucilla Andrews was a fully trained nurse - however the pay was still very poor and the hours long. She was briefly married to a doctor, who was to die from a lung disease. They had one child, Lucilla struggled as a young mother, to work and to care for her child. As well she was endeavouring to write. How I don't know! At one point in time she was existing on four hours sleep a night. The memoir ends with her leaving nursing and going to the country to spend time rewriting what was to be her first novel. As I read her novels as a teen, I never realised the author was such a wonderful, brave, indomitable woman. Very inspiring. This sounds like a very interesting book and like Teddyree, I, too, will be adding this to my list to read! Great review!!! Thanks Teddyree and Kristin. It is a very British book, but what I just couldn't help admiring was her spirit. It was actually a very good book for me to set the tone for 2014. THANKS for sharing and for stopping by my giveaway. I am going to be looking for this Kathryn. I love the romance of that time but also because I grew up loving hearing about Florence Nughtengale. She' was such a resilient woman.